The Tarka Trail, 180 miles long, follows in the footsteps of the character Tarka the Otter from Henry Williamson’s famous novel and passes through North Tawton, Devon. Henry Williamson was born in South-East London in 1895 and enjoyed the Kent countryside from a young age. Henry Williamson spent a holiday in North Devon just before the outbreak of the First World War and was enthralled by its wild beauty. His novel Tarka the Otter brought him the prestigious Hawthornden Prize for Literature in 1928. Tarka the Otter: His Joyful Water-Life and Death in the Country of the Two Rivers remains a highly influential novel by Henry Williamson, first published in 1927 by G.P. Putnam’s Sons. The original edition featured illustrations by Charles Tunnicliffe. 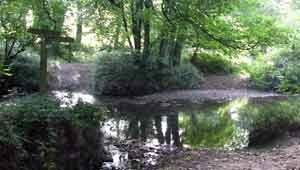 The Two Rivers refers to The River Taw and River Torridge. The book begins and ends in the vicinity of Torrington. The Trail splits into two loops centred at Barnstaple, North Devon, and is an excellent way to walk and explore the wild beauty of the Devon countryside. Going counter-clockwise from Barnstaple, the North Loop heads inland along the tidal section of the River Taw. 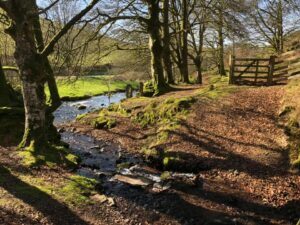 The Trail takes you through little villages with cob and thatched cottages, and rocky deep-cut lanes and wooded valley paths until it reaches breathtaking Exmoor National Park; famous for its Lorna Doone Valley. The South Loop runs through North Tawton, Bondleigh, Sticklepath, Belstone, Dartmoor, Okehampton, Jacobstowe, Hatherleigh, Iddesleigh, Meeth, Petrockstowe, and Torrington, West Devon. The Tarka Bridge crosses over the River Taw. FREE Tarka Trail Map and Information, provided by Devon County Council, available to view and download. Picturesque map booklet guides you around the 11 circular walks: Circular Routes. Read more About North Tawton. Visit North Tawton Mobile Library for Tarka the Otter book.